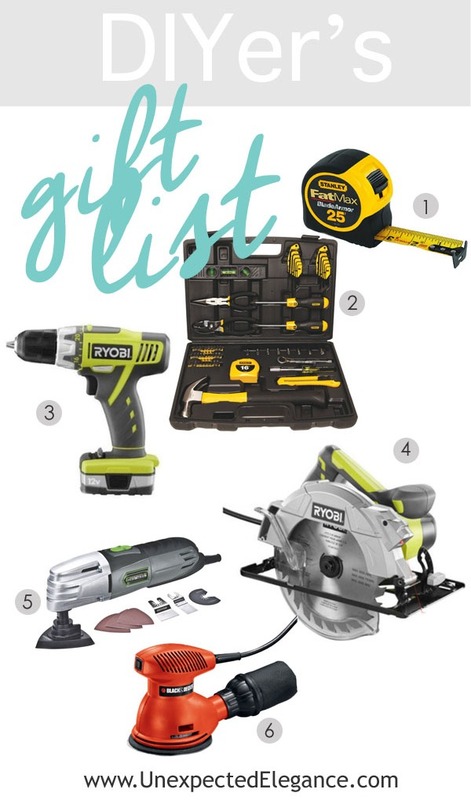 Do you have a DIY lover you are buying gifts for this year? Over the years I have learned some great tips from my dad and everything else though trial and error. I had absolutely no skills and had never used a power tool until about 7 years ago. Now I absolutely LOVE “my tools” and get a little giddy when I get a new one! So, I thought I would share with you my top picks for the newby DIYer. This is an absolute MUST. You need a tape measure for just about every project under the sun. My suggestion would be to purchase a nice one that is only metric and locks. This has a variety of tools that most people need on a regular basis. Even a non-DIYer should own a basic set like this! This is another tool that you need for most projects. I would also throw in a set of drill bits. Circular saws are great to have because they can be used for a variety of different things. You make simple cuts and even “rip” a larger piece of wood down. This is one of my favorite tools. I use it way more than I ever thought I would. You can buy different blades and it cuts anything from drywall to baseboards. Great for the precise and small cuts. This is the most versatile sander and fairly inexpensive.